Update: Avengers 3 is out! Check out our full list of characters who died in Infinity War HERE! With Captain America: Civil War dominating the box office the entire first half of the summer and their impressive showing at this year’s San Diego Comic Con, things have never looked better for Marvel Studios. Right now it seems like the hype can’t get any bigger, but in just a few short years audiences will experience the culmination of the Marvel Cinematic Universe’s first three phases with the highly-anticipated, two-part Infinity War. With Part I and Part II set to come out in 2018 and 2019 respectively, and Josh Brolin cast to play the iconic villain Thanos, Marvel fans are ecstatic. Based on the popular Infinity Gauntlet comic arc, Infinity War is a story that sees legendary cosmic Marvel villain Thanos obtaining the five Infinity Stones and wreaking havoc on the very fabric of the Marvel universe. The original Infinity Gauntlet arc was a shocking event, as it basically had Thanos kill all of our beloved Marvel heroes as he became increasingly more powerful, eventually eliminating the Celestials and becoming the living universe itself. Even if Marvel decides to go a different route with the story (as they have with other comic-to-film arcs in the past), we are sure to see some of our favorite Marvel Cinematic Universe characters bite the dust. Here are The Top 15 Marvel characters Most Likely To Die In Infinity War. Perhaps this is obvious, but it still needs to be part of the list. The MCU has been criticized for its lack of compelling villains, in part because they have a tendency to kill them off before they have a chance to be developed. Across all of the films so far only Loki, Baron Zemo, Justin Hammer, and the Abomination have lived to see another day. The rest seem to mostly get blown up by nuclear reactors or torn apart from the inside by an Infinity Stone. Although the directors promise that he will be one of the more developed MCU villains, Thanos will probably not be an exception to this rule. If Marvel is truly going to make the Mad Titan as menacing and powerful as he is in the comics, there is no way the heroes will be able to stop him without ending his life permanently. In Guardians of the Galaxy, Drax the Destroyer is a man out for revenge. Throughout the movie, he is obsessed with killing Ronan the Accuser, the villainous Kree who slaughtered his entire family in front of him. When he finds out that Ronan was acting under the orders of the Mad Titan, he declares “Thanos is the real mission” and sets his sight on avenging his loved ones once and for all. 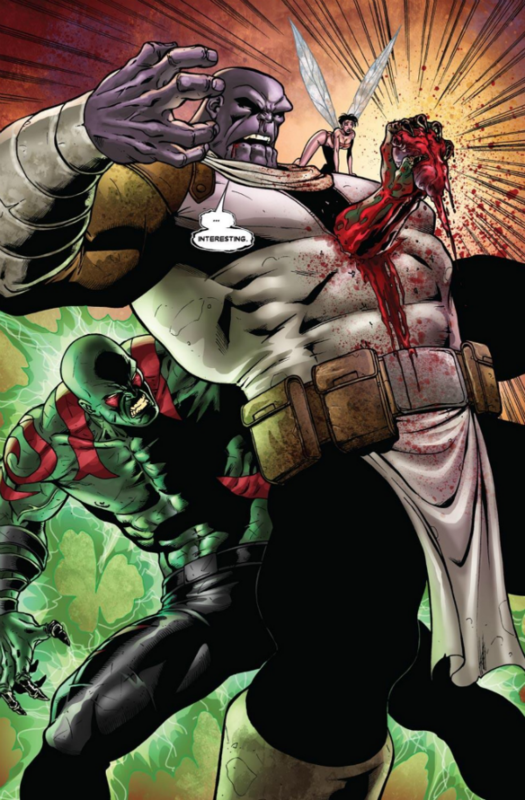 Drax and Thanos have a history, including the famous scene in which Drax literally punches Thanos’s heart out of his body. A similar scene could go down in Infinity War, but with Drax instead sacrificing himself to save his friends and put an end to Thanos’s madness. It would actually be the perfect ending to his story. The rough, lovable loner would make the ultimate sacrifice for his friends and finally be reunited with his family. Wanda Maximoff, AKA Scarlet Witch, is easily one of the most powerful Avengers in the group’s history. Her mystical powers range from creating fear-inducing hallucinations to wiping out a majority of the world’s mutant population with a single phrase. However, in the MCU, Wanda’s powers seem to have been reduced to a more telekinesis-like state. Perhaps this is to compensate for the rest of the Avengers, who seem to have varying degrees of power in different situations, or perhaps the character has simply not reached her full potential in the MCU yet. Either way, Scarlet Witch is expendable. She has only been featured in two MCU movies so far, and even then it was only as a secondary character. She has been ridiculously under-powered throughout her entire tenure despite still being considered one of the strongest Avengers. When Thanos arrives, she’s a goner. One of the most common movie tropes used to show a villain’s strength is to have him take down one of the most powerful heroes; Wanda fits the bill perfectly. Let’s face it, Michael Douglas isn’t getting any younger. At age 71, it was obvious to see why Marvel decided to cast him as Scott Lang’s mentor. Pym is at the end of his story; he spent the first Ant-Man movie teaching Scott and his daughter Janet everything he knew about Pym Particles and how to be a superhero. His job is done. If Marvel wants to explore the character any further they will most likely do so in a prequel (when Hank Pym himself was Ant-Man). Likewise, Scott is not an Avenger. He will not get involved with the Infinity Gauntlet unless he has some stake in the outcome. What better way to give him motivation than by having Thanos or one of his lackeys kill off Pym in their initial invasion? Part of Thanos’s whole shtick is crossing across different galaxies and dimensions in order to find the Infinity Stones wherever they may be hiding. This quest will eventually lead him to the realm of Asgard, where the Tesseract is currently being held for safekeeping. Nobody crosses through the Bifrost without the notice of Heimdall, its sworn protector. As seen in both of the Thor films, Heimdall does not take kindly to intruders in his realm, taking up his sword to strike down all who trespass. When Thanos arrives with his army, there is no doubt that Heimdall will try and stop him. Whether that be alone or with the Asgardian military at his back, the Bifrost protector’s fate looks grim against superior numbers and a more powerful foe. Now, this entry is based entirely on the theory that Red Skull did not die from the Tesseract in Captain America: The First Avenger, but was instead transported to another realm. If this theory holds true, Johann Schmidt would have come face to face with the Mad Titan and his forces. After Loki’s failure in The Avengers, Thanos needs a good military commander to lead his army, and who would be better than the German officer who attempted a hostile takeover of the entire world? If Red Skull is to return, then this would also make him a prime candidate to perish. Thanos does not take kindly to failure. He could easily dispatch of Red Skull at the end of Infinity War -- Part I after the Avengers hold back a second invasion of earth. Likewise, he could be killed by Captain America once and for all during their inevitable encounter. Other than one of the core Avengers, which hero's death would have a larger emotional impact than Nick Fury? He has been there since the beginning (literally), and has shown up in numerous MCU films as the director of S.H.E.I.L.D. and as a friend/foil to their titular hero. He’s the premiere badass of the MCU, and will without a doubt stand with the other Avengers as they take on the Mad Titan. Of course, Fury has no powers at all. He can’t fly or summon lightning or wield a bullet-proof shield, meaning that he’s prime cannon fodder for Thanos’s lackeys. Samuel L. Jackson has appeared in seven of the nine films he originally signed on for, and although the actor says he would love to extend his contract, Infinity War would be the perfect time to send off the character. “Thunderbolt” Ross, the Incredible Hulk’s arch-nemesis, currently sits as Secretary of State of the United States of America. However, as evidenced in Captain America: Civil War, Ross has a tendency to throw himself right into the thick of things. When an invasion by an unearthly force is upon the world, Thaddeus Ross will no doubt be called upon to defend the country. Killing off Thunderbolt Ross would make perfect sense from a story perspective. He would be the only major character present at a U.S. Army vs. Thanos showdown, giving the viewer a perspective on the invading army’s might. His death would open the door for the overturning of Sokovia Accords (a document that he so fiercely supported) as well as set up tension between Betsy Ross and Bruce Banner should Marvel ever decide to make another solo Hulk film. Anyone who has read the original Infinity Gauntlet storyline knows why Nebula is on this list. In that story, it is she who ultimately leads to Thanos’s defeat by stealing his infinity gauntlet and reversing everything he had done prior. This sets up the revived heroes up to defeat the Mad Titan once and for all. Of course, Marvel could go a completely different route and leave her as a loyal servant, having her take the place originally held by Mephisto in the comics. Nebula is close to Thanos in the MCU. In addition to being his daughter, she serves as his messenger/lackey for his dirty deeds across the galaxy. If she does indeed betray him in Infinity War, don’t expect him to take it lightly. Recently-released concept art from Guardians of the Galaxy Vol. 2 shows Nebula posing with the gang of heroes - perhaps her change of heart will come sooner than expected? Either way, Nebula’s future seems grim. Now we get into the really heavy hitters. Thor is one of the most popular Avengers and arguably one of the most popular characters in the entire MCU. Despite his popularity, his movies seem to be hit-or-miss with most people; the Thor film franchise is currently the lowest earning film series in the MCU. Both movies have made boat loads of money, but not as much as the Captain America, Iron Man, or The Avengers films. Thor: Ragnarok is set to wrap up the trilogy as well as tie the world of Asgard into the struggle for the Gauntlet. With Thor confirmed for Infinity War - Part I but not Part II, it makes one wonder what fate has in store for the God of Thunder. Besides, Marvel has already gone on record about wanting to change up the Avengers teams (as seen at the end of Age of Ultron), and eliminating one of their strongest characters would present an interesting challenge for the team moving forward. The death that was teased all throughout the second Avengers movie may finally come to fruition during Infinity War. Even Clint Barton (AKA Hawkeye) himself realizes how under-powered he is when facing off against Avengers baddies: “The city is flying and we’re fighting an army of robots. And I have a bow and arrow. Nothing makes sense,” he grumbles amid the chaos of Age of Ultron’s climax. Although the character may be out of his league with his fellow heroes, fans have fallen in love with Jeremy Renner as Hawkeye. Marvel, on the other hand, doesn’t seem to know what to do with Barton. He has a large role in Age of Ultron, but was under mind-control for most of the original Avengers and was just a secondary character in Civil War. Hawkeye talks about how much he wants to retire, walking away from the Avengers at the end of Age of Ultron. If Clint Barton gets dragged into Infinity War, don’t expect him to come out alive; Thanos and his legions may finally be too much for the sharpshooter. Even as the current ruler of Asgard, Loki will not be safe from the wrath of the Mad Titan. Way back in the original Avengers, the God of Mischief led Thanos’s forces through a wormhole in a full-scale invasion of earth. And he failed... badly. Not only was he unsuccessful in conquering earth, but in his failure, he brought Earth’s Mightiest Heroes together. Perhaps he will get a second chance, or perhaps Thanos will kill him on sight. Even if it’s the former, it’s only a matter of time before Loki attempts to take the gauntlet for himself (and most likely fails). Besides, it is probably time for audiences to say goodbye to Loki, considering he has been a main antagonist in four separate MCU movies. Losing the leader of the team is something that raises the stakes to new levels. He has survived fights against Hydra, Nazis, Ultron, and his own friends, but could Thanos finally be the nail in Steve Roger’s coffin? All signs point to “yes.” The writing is on the wall: Chris Evans has mentioned that he wants to take a break from acting and Sebastian Stan (Bucky Barnes) is signed on for six more MCU movies. In the comics, Bucky took over after Steve Roger’s tragic assassination. Currently, Sam Wilson holds the mantle of Captain America in the 616 universe. Both characters have been played up in the MCU, foreshadowing a potential passing of the shield to either in the near future. Storywise, Cap’s death makes sense. In Age of Ultron, Tony Stark saw a vision of the broken shield along with all of his dead teammates. It is assumed that Stark was not seeing a mere hallucination, but a vision of the future. Marvel will also not pass up the opportunity to have the iconic scene in which Captain America, the literal last man standing, refuses to yield. To which Thanos responds, “Noble sentiments from one who’s about to die.” Steve Rogers will use his last fighting breath to defend the planet he calls home. This is the big one. Tony Stark is far and away the most popular character in the entire MCU. His death would rock the very foundation of the MCU. And that is just one of the many reasons that he will die. Thanos is supposed to be the most fearsome villain the Avengers face in the entire series. Being responsible for the death of Tony Stark is the quickest way to earn the vitriol of fans everywhere. Tony’s story doesn’t really have anywhere else to go; Pepper broke up with him, he’s still suffering from the guilt of Ultron, and his role in the Avengers program has diminished greatly. It’s time for Iron Man to hang up his mask forever, and death seems to be the only way. Robert Downey Jr. has been extremely wishy-washy about returning for another Iron Man movie. At first, he said he was done with the character after the third Avengers. Then, he signed on to be the antagonist in Civil War and is up for a cameo in Spider-Man: Homecoming. Now he claims that he would be up for a fourth Iron Man if there was a good enough story. Marvel may want to dump RDJ for financial reasons, as he negotiated his contract so that he receives a large portion of the total box office for each MCU appearance. Infinity War needs a big death and it seems like his will be it. While this may not be the most shocking or impactful death on the list, it takes the number one spot because it is the only one that is just about guaranteed. From his first appearance in Age of Ultron, we know how powerful Vision is. He picks up Thor’s hammer as if it is nothing, rips Ultron’s robots to pieces effortlessly, can phase through any sort of material, and uses the Infinity Stone in his head to vaporize his enemies. He is just about unstoppable. Even Scarlet Witch’s powers can do little but slow him down. However, it's almost certain he is going to die. Teasers for Infinity War show Thanos with the completed Infinity Gauntlet. All six Infinity Stones are accounted for. Except, one of those stones is currently powering Vision. It doesn’t take a rocket scientist to figure out that he is doomed. It will make for an extremely powerful scene, too. Seeing Thanos defeat Vision, the most powerful member of the Avengers, will cement him as the greatest threat the team has ever faced. There you have it, the 15 characters most likely to die in Infinity War. Do you agree with our list? Disagree? Shoot us a comment below to let us know! Doctor Strange opens November 4, 2016; Guardians of the Galaxy Vol. 2 – May 5, 2017; Spider-Man: Homecoming – July 7, 2017; Thor: Ragnarok – November 3, 2017; Black Panther – February 16, The Avengers: Infinity War Part 1 – May 4, 2018 Ant-Man and the Wasp – July 6, 2018; Captain Marvel- March 8, 2019; Avengers: Infinity War Part 2– May 3, 2019; and as-yet untitled Marvel movies on July 12, 2019, and on May 1, July 10, and November 6 in 2020.